Memory enables us to use past experience to anticipate and prepare for future challenges. But memories can only be used adaptively if they are retrieved at the right time and place. For instance, memories of a traumatic experience can be useful in helping one avoid or confront situations similar to the original trauma. But retrieval of trauma memories in inappropriate situations is maladaptive. Anxiety disorders such as post-traumatic stress disorder and phobia are believed to occur, in part, because of the inability to suppress recall of aversive memories. The major aim of our lab is to understand how the brain forms memories of our experiences, how these memories are retrieved at the right time and place, and how these memories can be suppressed. We focus on the hippocampus, a region of the brain that is specialized for rapidly generating detailed, multimodal memories of our experiences, called episodic memories. We study hippocampal function in mice because of the availability of genetic tools that give us the ability to manipulate neurons and neural circuits with unprecedented precision. Our specific interests include the following. Adult hippocampal neurogenesis is conserved across mammals from mice to humans. Changes in the rate of adult neurogenesis correlate with clinically important outcomes. For instance, stress potently suppresses hippocampal neurogenesis, while exercise, environmental enrichment, and virtually all antidepressant treatments stimulate adult hippocampal neurogenesis. We are trying to understand how adult neurogenesis influences these processes. We use genetic manipulations in mice and behavioral analysis to answer questions such as: Which aspects of hippocampus-dependent memory and behavior require adult neurogenesis? 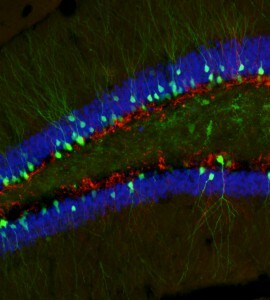 How are adult-born neurons functionally differentiated from developmentally-generated neurons? What properties of adult-born neurons confer their unique functions? 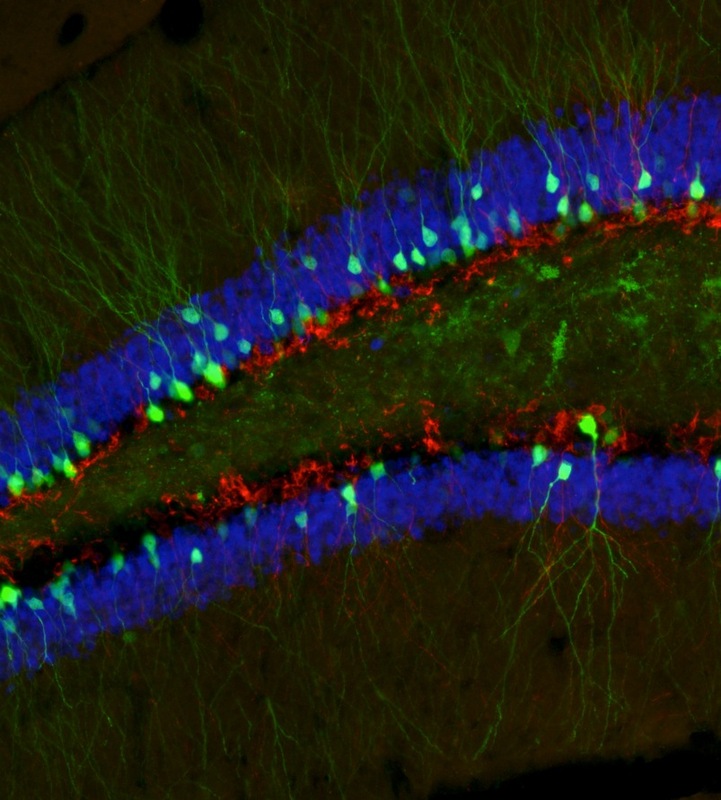 Our lab has developed approaches for selectively ablating adult neurogenesis and silencing adult-born neurons in mice. Using these approaches we have identified specific mechanisms through which adult-born neurons contribute to hippocampal memory and emotional regulation. Context memories are multimodal memories of time and place that can be used for different purposes. A context can acquire emotional valence, such as in contextual fear conditioning, where a context acquires the ability to elicit fear. Or a context can help disambiguate the meaning of other stimuli, while remaining neutral itself. For instance, if one is driving down the highway at 80 mph, the sound of a siren may induce fear or anxiety; but if one is sitting in the living room, the siren is not likely to elicit an emotional response. The context (highway versus living room) determines how the siren is interpreted. We are interested in how these different uses of context memory are mediated in the brain. Can they be localized to different subregions or longitudinal segments of the hippocampus? How do the neural representations change over time? In the clinic, maladaptive fear is commonly treated using extinction training, a form of exposure therapy in which repeated presentations of a fearful stimulus in the absence of threat gradually reduce fear. Unfortunately, extinction does not permanently suppress fear. With the passage of time after extinction, the original fear typically returns, a phenomenon called spontaneous recovery. Because of spontaneous recovery and other similar phenomena, scientists have long believed that extinction does not erase the original fear memory but instead creates a new memory that inhibits or competes with the original fear. A key challenge in the field of learning and memory has been to understand how fear and extinction memories are represented in the brain and the mechanisms that govern their competition. 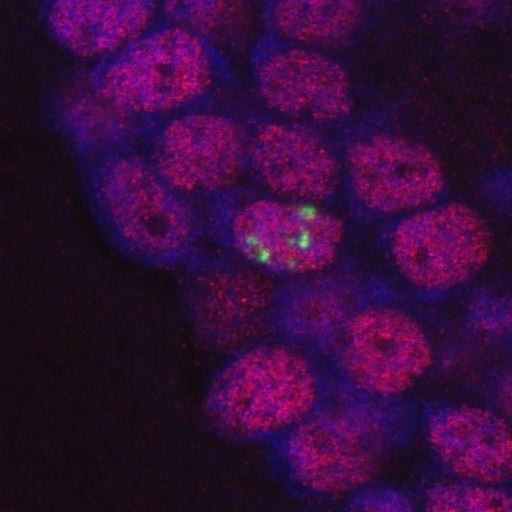 We are currently investigating how extinction memories are represented in the hippocampus, using in vivo imaging and activity-dependent neural tagging, a technique that allows us to permanently tag (with a fluorophore or another heterologous protein) neurons that are active during a particular behavioral experience. Our goals are to understand the circuit mechanisms through which extinction memory suppresses fear and how these extinction circuits change over time (extinction tends to weaken over time). In addition to answering longstanding questions about the mechanisms of extinction memory, our goal for this work is to identify strategies to make extinction more effective in clinical situations.